spirit, originally uploaded by jahansell. This house is perhaps beyond the bounds of Ellsworth - I came across it when I took a wrong turn and found myself wending my way for mile after mile, not getting anywhere in particular. I finally pulled out my map and realized I was almost to Kent! 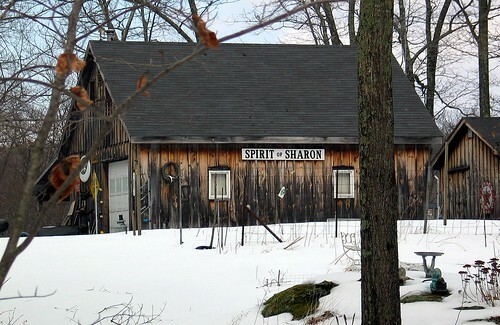 The experience suggested a new project for me - to travel every back road of Sharon and take a picture from each one! Not sure I'm quite prepared to commit to this - for such a small town, Sharon is quite large, geographically! What do you think - should I do it? Jenny, I love to give advice, esp. if it's solicited! I'd try it and then modify the goal according to your time constraints. You and we will learn a good deal from your project! Go for it!! As I remember, Sharon's the largest town in CT, geographically. Photographing every back road will be fun though, there are some great ones. Also, you should consider including the warren of back roads on the Sharon/NY border, up above the Valley. Some wonderful views and one absolutely amazing home (you'll know it when you see it) up there. A great challange and I know we will enjoy seeing your photographs. It's all going to be down to the Spirit of Jenny...Do you need another lifetime project at this stage of the championship?